You get amazing health benefits with our Linseed (Flax seed) Oil. It is fresh, as we cold-press in small batches. It's also one of the richest sources of omega 3 poly-unsaturated fatty acids, alpha-linolenic acid (ALA), containing 60%, yes 60% omega 3! It's full of essential fats and great for the whole family. *Omega 3 ALA (Alpha Linolenic Acid) from Linseed (Flaxseed) oil contributes to the maintenance of normal blood cholesterol levels. Our freshly milled Linseed (Flax seed) Meal also contains Omega 3 which contributes to the maintenance of normal blood cholesterol levels. You will also get a good source of Protein which contributes to the growth and maintenance of muscle mass and the maintenance of normal bones. Ground Linseed meal is extremely high in fibre and contains both soluble and insoluble fibre. It is also high in Vitamins & Minerals such as Ma gnesium, which has many benefits in the body including helping to support a healthy nervous and cardiovascular system. You will find Zinc in the meal and this contributes to the maintenance of normal bones and contributes to normal fertility and reproduction. In addition to these is Iron, Iron is important for oxygen transport in the body and the formation of red blood cells. Hence Linseed (Flax seed) is a Super Food! When you go online to buy Linseed or flax seed, whether it's in Oil or Milled Seed form, please ensure it is fresh! Never use the oil to fry or roast with! Use it cold and when fresh it has many different and positive health benefits for the body. Our linseed meal (crushed linseed) is a great source of soluble and insoluble fibre. Linseed meal and seeds are great sources of protein. Protein is the building block of life and is essential to the immune system and to help cell growth and tissue repair. Protein is digested slower than carbohydrate so it helps to provide a steady energy supply throughout the morning. Sprinkle linseeds and linseed meal onto muesli, granola or porridge at breakfast to increase its protein content. Linseed also contains lignans, see our article on Lignans here. 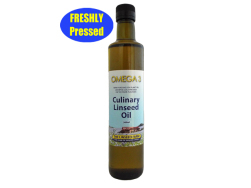 *Omega 3 ALA (Alpha Linolenic Acid) from Linseed (Flaxseed) oil contributes to the maintenance of normal blood cholesterol levels (the beneficial effect is obtained with a daily intake of 2g ALA, which equates to a teaspoon of oil or 5ml).